Kids can be in charge (with a little adult supervision) with a roll-on sunscreen applicator made for them. This set of two replacement heads means little hands—or big ones—are always prepared to roll on a dose of sun protection. Dimensions: 3.9" x 2.4" x 2.4"
I bought this for my grandkids and they love it! Great idea! 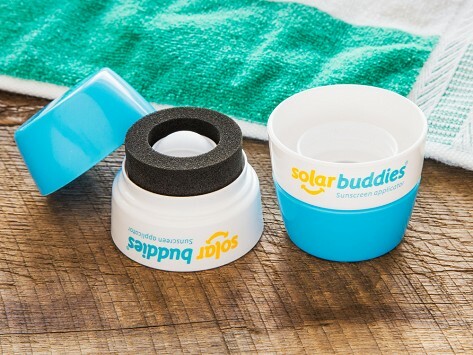 Solar Buddies roll-on sunscreen applicator was made by best friends Kelli Aspland and Laura Griffin to put kids (like their own) in charge of this important, but often messy task. These moms are also aiming to teach kids the importance of sun protection by including them in the process, too. The applicator is refillable and reusable, and is easy to hold thanks to an oversized grip. Kelli and Laura envisioned Solar Buddies for little hands to use, but are delighted to hear that the ergonomic design works well for folks with dexterity issues, too. We think the approachable applicator works for anyone who wants to add a dose of sun protection.